This beautiful Tiffany inspired dragonfly themed table lamp is a great addition to any decor and will add classic character to any room. 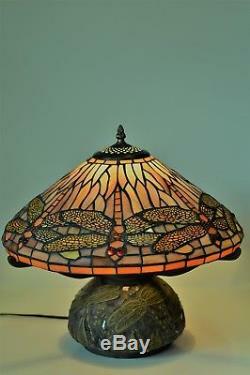 The lamp is crafted from quality stained art glass and has a mosaic base with an antique-style bronze finish. The lamps primary colors are green, brown and orange. Lamp stands 16 inches tall and has a shade width of 16 inches. Requires one 60-watt light bulbs (not included). Manufactured from quality metal and stained art glass. Shade has hues of green, tan, brown and orange. Art glass colors are lighter and more vibrant when illuminated. Requires (1) Edison base light bulb up to 60-watts (not included). Product includes a cord on / off switch. UL rated for dry locations. Product Weight: 8.0 lbs. Thank you for your interest. 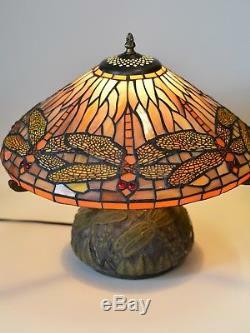 The item "Tiffany Style Stained Glass Dragonfly Table Lamp with Mosaic Base 16H x 16W" is in sale since Monday, September 10, 2018. This item is in the category "Home & Garden\Lamps, Lighting & Ceiling Fans\Lamps". The seller is "rssor" and is located in Ellington, Connecticut. This item can be shipped to United States, Canada, United Kingdom, Denmark, Romania, Slovakia, Bulgaria, Czech republic, Finland, Hungary, Latvia, Lithuania, Malta, Estonia, Australia, Greece, Portugal, Cyprus, Slovenia, Japan, China, Sweden, South Korea, Indonesia, Taiwan, South africa, Thailand, Belgium, France, Hong Kong, Ireland, Netherlands, Poland, Spain, Italy, Germany, Austria, Israel, Mexico, New Zealand, Philippines, Singapore, Switzerland, Norway, Saudi arabia, Ukraine, United arab emirates, Qatar, Kuwait, Bahrain, Croatia, Malaysia, Brazil, Chile, Colombia, Costa rica, Dominican republic, Panama, Trinidad and tobago, Guatemala, Honduras, Jamaica.